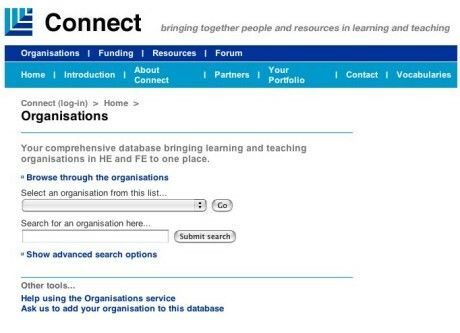 HEFCE (Higher Education Funding Council for England) funded the initial 'Finder' project to develop learning and teaching portal services as part of its Information Environment development. System Simulation developed the portal jointly with JISC and the Learning and Teaching Support Network (LTSN), a major network of 24 subject centres based in HE institutions throughout the UK and now forming part of the Higher Education Academy. The Connect services are primarily designed to meet the needs of staff within universities and colleges who support learning and teaching (including librarians, learning technologists, staff developers and curriculum developers); though some of the services are of interest to senior managers and to teaching staff. A particular feature of the project was that the services were designed to be embedded in other educational sites and portals and considerable advances were made during the project, both in terms of the conceptual framework for embedding and of the embedding tools that were developed. These advances covered WSRP and iFrame technology. Other aspects of the project involved the development of cross-searching, the application of extensive terminology and thesaurus systems and experimentation with a Visualiser system.